To compete in the age of the Instant-On Enterprise, your organization needs an IT infrastructure that enables agile and rapid service delivery while driving out costs. 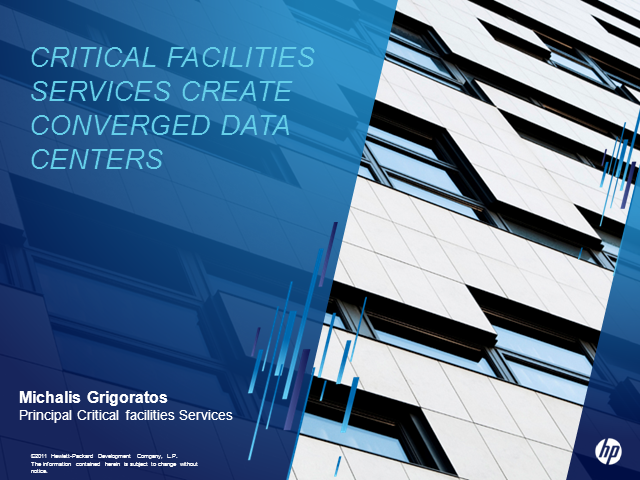 Converged Infrastructure allows you to accelerate time to business value. This is achieved through leading technologies designed for convergence and a systematic approach that turns todayâs rigid technology silos into adaptive pools of assets that can be shared by many applications and managed as a service. This helps you increase IT speed and agility, shift resources from operations to innovation, and better align with the growing demands of the business. Converged Infrastructure integrate hardware, software and services into turnkey systems to help businesses harness the full potential of virtualization, cloud and next generation applications. Michalis is a highly experienced Mechanical Engineer who specializes in multi-disciplinary design projects within the commercial, public and Critical Facilities Sectors with experience in the wider EMEA Region. Michalis has strong technical as well project management skills; he has previously project managed and delivered highly complex projects at given deadlines, applying his understanding of building and design issues. Michalis promotes passive engineering solutions and focuses on delivering projects with a holistic consideration to design. He has experience in delivering sustainable design solutions and a keen interest in the study of the built environment and its influences on the perception of comfort. He has received hi Bachelors and Masters Degree in Mechanical Engineering by Kingston University London.